Rahul Dravid has once again proved to be Mr Dependable. It was he who along with Dinesh Kaarthick steadied the team after the dismissal of captain Sourav Ganguly. Umpire Steve Bucknor has expressed regret for handing out a wrong decision to Sachin Tendulkar when the latter looked set for his record-breaking 35th century on the third day of the second Test between India and Pakistan. The Madras High Court today rejected a plea by former cricket board president Jagmohan Dalmiya to exempt him from appearing before a city civil court in connection with a contempt of court application filed against him. It is ironic that even as India is preparing to host mega sports events like the 2010 Commonwealth Games and the 2006 ICC Champions Trophy Cricket Championship, the government is planning to reduce the strength of the coaches under the Sports Authority of India (SAI) fold as a “cost cutting measure”, which, experts feel, “is a retrograde step”. Sunny Singh slammed a brilliant century to put Haryana on top in their Ranji Trophy Plate group semifinal match against Jharkhand at the Sector 16 cricket stadium here today. Sunny struck 137 as Haryana put an impressive 453 on the board. In reply, Jharkhand suffered early jolts and were two wickets down for 9 at close. Giant screen for the third Test against Pakistan in Bangalore. The Ranji Trophy Elite Division semifinal between holders Mumbai and Punjab was poised for a close finish after the second day of the five-day clash at the Wankhede Stadium here today. Powered by a brilliant hat-trick by international Gagan Ajit Singh, Punjab thrashed Jharkhand 8-1 in the 61st National Hockey Championship for the Rangaswamy Cup. Favourites Tamil Nadu, Services and Chandigarh scored easy victories over their rivals, while hosts Hyderabad benefited from a hat-trick by centre forward M.A. Aleem . India’s Amandeep Johl birdied three of the final six holes to zoom into the top 10 at the end of three rounds of the million $ TCL Classic golf tournament at the Yalong Bay Golf Resort at the Hainan Island, China. Mukesh surged into the lead playing a fiery round in the Rs 10 lakh Hero Golf Chandigarh Open with a card of five under 67 for a tally of seven under 209 after 54 holes here today. SAI centre, Kurukshetra, downed 11 Dogra Regiment 2-0 to enter the semifinals of the first Jasbir Memorial Volleyball Tournament which commenced at the Polo Ground here, today. When Dravid was returning to the pavilion after being dismissed, he received a thunderous applause from the crowd and his team-mates. Ganguly and Tendulkar came to the field to embrace him for his outstanding feat of scoring two hundreds in a Test for the second time in his career. India coach John Wright said his team had 80 per cent chances of winning the Test, while Pakistan coach Bob Woolmer was certain that the match would end in a draw. Ganguly said if the bowlers repeated their show in the first innings, India could pull off a victory. Sachin Tendulkar has no ill-feeling against umpire Steve Bucknor for the latter’s “wrong judgment”. Sachin has accepted it as an accident and he felt Bucknor’s decision was not deliberate. Today, Sachin as well as Ganguly sent bouquets to Bucknor in his hotel room to congratulate him for completing 100 Tests. The Pakistan players, however, plan to celebrate the occasion after the conclusion of the match tomorrow at Taj Bengal hotel where the Indian players and the coach have also been invited. Mr Jagmohan Dalmiya, CAB chief, and other officials are in a fix as they still do not know if Chief Minister Buddhadeb Bhattacharjee would be available at tomorrow’s presentation ceremony after the end of the match. Mr Bhattacharjee left for New Delhi this morning following a call from the Prime Minister for a meeting tomorrow at South Block to discuss the Darjeeling problem at his behest. Before leaving the city, he had assured Dalmiya that he would try to be present at the Eden tomorrow in time, provided his meeting with Dr Manmohan Singh did not last long and he could catch the noon- time flight to be back to Kolkata before the presentation ceremony. However, he asked Dalmiya to make an alternative arrangement. Dalmiya was trying to contact state Governor Gopal Krishna Gandhi. Bucknor, who himself created a world record at Kolkata for officiating in his 100th Test match, virtually admitted an error in judgement that cut short Tendulkar’s masterly innings in fading light towards the end of day’s play at the Eden Gardens. 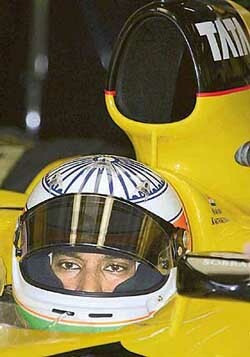 “I havn’t seen the TV replays, but mistakes are going to happen, you feel bad whenever you make a bad decision. It could be yesterday, last year or even today,” the veteran umpire from the West Indies said. The umpire, however, wanted to leave the issue behind and said he would try to concentrate more on the job so that he would not repeat such mistakes and said, “life must go on”. Incidentally, Tendulkar was one of the few players who personally congratulated the West Indian umpire for achieving the feat of officiating in his 100 Test match on the opening day of this match. Meanwhile, the International Cricket Council today felicitated Bucknor for achieving the milestone of officiating in 100 Test matches. Bucknor was presented golden bells by ICC President Ehsan Mani during the tea break on the fourth day. Justice S.M. Ibrahim Kalifulla declined to grant the relief when Dalmiya’s counsel Somyaji sought it while mentioning the matter before the court. VIth City Civil Court Judge Mohideen Pitchai had yesterday directed Dalmiya and present board secretary S.K. Nair to appear in the court on March 21 for an alleged contempt of court. Presently, there are about 1,500 coaches on the SAI rolls, but the government wants the number to be trimmed to 800. The government has long since stopped appointing new coaches, and all future appointments would be made on an “ad hoc” basis. This move to perpetuate “ad hocism” has been strongly resisted by coaches and top sports administrators. SAI director-general Ratan P Watal, secretary Dr BK Sinha and Executive Director (Team’s Wing) MP Ganesh made no secret of their opposition to curtailing the numerical strength of the coaches. Ganesh, a former hockey Olympian and chief coach of the national team, felt that the country needed the services of at least 10,000 coaches and bringing down their strength would be counter productive. But he admitted that the coaches should deliver results and be role models to their trainees. “The trainees should look up to the coaches for inspiration, guidance and emulation”, Ganesh said, while making the inaugural address at the first National Seminar of Coaches, organised by the All-India SAI Coaches Welfare Association, here today. Dr BK Sinha, in an eloquent exposition of the role of coaches, said coaches played a primary role in producing champions, and there should not be any roadblock in their smooth and efficient functioning. He did not favour appointing coaches on an ad hoc basis. “Ad hocism would bring uncertainty and lack of commitment among the coaches”, he warned, adding that “the coaches may not work with commitment and sincerity due to the impermanence in the nature of their jobs”. Mr Watal, who took over as the Director-General of the SAI two weeks ago, and has considerable experience as a sports administrator, felt that India being an emerging world power, should think big of winning Olympic gold medals, instead of settling for lesser honours. He agreed with Dronacharya Awardee boxing coach OP Bhardwaj that Indian coaches were “second to none” and it was just a question of their priorities getting right to focus on their goals, and producing champions, instead of being satisfied with the second-best and also-ran positions. Mr Watal, who was part of the high-powered team which worked tirelessly and imaginatively to make the 2002 National Games and the inaugural Afro-Asian Games 2003 in Hyderabad grand successes, said the SAI was in the process of addressing the three key issues of upgrading and modernising infrastructure, making available equipment suited to the needs and conditions of the country and personnel management through proper placement of coaches and officials, on a priority basis. He conceded that “equipments are important determinants in the end result” and promised to provide better facilities to coaches in exchange for sure-shot results in big events like the Asian Games and the Olympics. He also hinted at reviving SAI’s Special Area Games scheme to tap talent from the hinterland of the country. He admitted that funds were a problem, “but we can prioritise our requirements to have a larger vision of sports promotion”. Mr Watal said the Sports Ministry has entrusted the job of widening the scope of the School Games to the SAI, to work out the nitty-gritty with state-level departments, by making use of the vast army of physical education instructors across the country. Mr Watal expressed shock at the declining standard of NIS, Patiala, which was once the topmost coaching institute in Asia. He promised to do his best to bring NIS back to its old glory, “though a lot has to be done for that.” He said the SAI would revive its newsletter to give feedback of its activities across the country, and start its own website either on its own or by integrating with the NIS website. OP Bhardwaj, who was the national boxing coach for over 20 years, lambasted the tendency to glorify foreign coaches and belittle the efforts and contribution of the Indian coaches who had toiled hard to take Indian sports to the present level. He said top coaches like OM Nambiar, Desh Prem Azad, Gurcharan Singh, Guru Hanuman, Mohd Ilyas Babar, Shyam Sunder Rao, Kenneth Owen Bosen, Michael Ferriera, MK Kaushik, Rajinder Singh and others had produced more champions than all the foreign coaches put together on whom the government has spent crores without getting even a fraction of success in return. Bhardwaj pointed out that India produced world-class sportspersons like Milkha Singh, GS Randhawa, Makhan Singh, Sri Ram Singh, Bhim Singh, Joginder Singh, TC Yohannan, PT Usha, Sania Mirza, Vijay Amritraj, Leander Paes and many others without the aid of foreign coaches. Veteran sportspersons Sri Ram Singh, Hansa Sharma, Gopinath Ghosh, Shyam Lal Khullar and OP Bhardwaj were honoured on the occasion by presenting them with mementoes. Coaches from all over the country attended the seminar, which was organised by SAI cricket coaches MP Singh and Sunita Sharma. It turned out to be a day when nothing went right for Jharkhand. Their bowling looked ordinary as rival batsman after batsman made merry enabling Haryana to pile up a big total before being bowled out. Their batsmen, in whatever little time was available for the day, gave a sloppy display to complete a fruitless outing for the team on the second day. Jharkhand got an early success when they were able to evict Shafiq Khan early when the batsman had yet to add to his overnight score. But it turned to the only happy moment for them during the day. The rest of the Haryana batsmen batted well enough and frustrated the rival bowlers throughout the day. 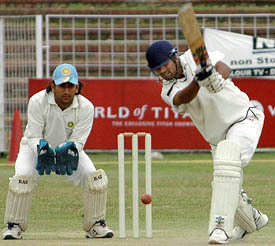 All-rounder Joginder Sharma, who recently played one-day matches for India against Bangladesh, hammered a 50-ball 38. Former India wicketkeeer and skipper Ajay Ratra chipped in with 40, while leg-spinner Amit Mishra played an impressive cameo. Driving and cutting with aplomb, he added 47 studded with eight fours. Number 8 batsman Sachin Rana was a revelation. He thwarted the rival bowling attack for nearly three-and-a-half hours and struck 83. Not to be left behind, No. 10 batsman and off-spinner Gaurav Vishisht contributed 21 as Haryana posted 453 on the board. Seamer SS Rao was the most successful Jharkhand bowler and claimed four wickets. In the four overs that were bowled before the close of play, Jharkhand lost two crucial wickets. Seamer Jatinder Malik struck in his first over, clean bowling opener Subroto Gosh, while leg-spinner Amit Mishra castled S Nadeem. Fall of wickets: 1-9, 2-12, 3-119, 4-138, 5-194, 6-292, 7-308, 8-396, 9-446. Bowling: SS Rao 33-4-129-4, Mhir Divakar 27-3-116-1, S Nadeem 28.2-11-56-2, Sumit Panda 17-3-40-1, S Khan 36-8-96-2, Manish Vardhan 2-0-8-0. Fall of wickets: 1-3, 2-9. Bowling: Joginder Sharma 2-1-3-0, Jatinder Malik 1-0-1-1, Amit Mishra 1-0-5-1. The hosts skittled Punjab, who resumed at overnight 42 for 2 in reply to Mumbai’s modest first innings tally of 251, for a meagre 126 in under 62 overs and just over four hours. But Punjab, who conceded a lead of 125, which may prove decisive in the low-scoring tie, then hit back strongly to reduce Mumbai to 112 for 8 by close. Mumbai, in fact, were tottering at 82 for 8 with just over 10 overs remaining for stumps. But left- hander Nishit Shetty, unbeaten on 33 after a vigil of 90 minutes, and tailender Nilesh Kulkarni (7 in 48 minutes) held fort till stumps. The ninth wicket duo have produced the best stand of the Mumbai second innings, an unfinished 30 runs, and at the end of an absorbing day’s proceedings the hosts were 237 in front with two wickets in hand. With 16 wickets falling today, including eight in the visitors’ first innings, and 12 yesterday, tomorrow might well bring an end to the match in which most wickets have fallen to poor shots rather than due to vagaries of the pitch. Eight out of 10 Punjab wickets fell to the Mumbai spin trio of captain Sairaj Bahutule, Kulkarni and Ramesh Powar. In the home team’s second essay, medium pacer Gagandeep Singh once again did the bulk of damage by taking four wickets to add to his identical tally in the first innings. NEW DELHI: Hyderabad wasted a golden opportunity to take firm control of the Ranji Trophy Elite Division semifinal against Railways after suffering a top-order collapse in their second innings on the second day of the match here today. The visitors, who were bowled out for 166 in the first innings, came back strongly to restrict the hosts to 180 runs this morning. Tamil Nadu opened its group-F campaign with a big win against minnows Mizoram 16-1 yesterday. Another contender, Chandigarh, which had drswn their opening group-B match against Mumbai on Thursday, put up a spirited show and blanked hapless Rajasthan 16-0, with the winners leading 7-0 halfway. S S Gill and M K Parkash scored three goals each, while Chander Pal and Gurutej scored two each. Jeev Milkha Singh and Harmeet Kahlon, the other two Indians left in the field, had contrasting fortunes. Jeev recovered from a double bogey on the par-four second to finish at three-under 69 for the day and go upto 10-under for three days and a tied 25th position up from tied 38th after two days Kahlon, seven-under at midway stage after two rounds, slipped with a two-over 74 and a tied 65th position down from tied 38th. Scot Colin Montgomerie, needing to finish in top two for a place in world top 50 and a berth into the Masters, overcame a disastrous streak of three bogeys from fourth to sixth, to come back with a four-under 68 and vault to the shared top spot. He is tied for first with Paul Casey of England and Thai Chawlit Plaphol. Plaphol held the Asian flag aloft at 16-under after a superb round of six-under 66 in the third round. Casey carded a four-under 68. Montgomerie, tied second after two round, birdied the seventh, ninth and 13th and finished in style with two straight birdies on the 17th and 18th to put himself in a strong position to win the title he won in the inaugural year in 2002. Johl, whose previous two rounds were five-under 67 and four-under 68 added another round of four-under 68 to go to 13-under 203 after 54 holes. The event being played on the lush course of the Chandigarh Golf Club, forms the 16th leg of the Amby Valley PGAI Tour 2004-05. Closely following the current money list leader on the Amby Valley PGAI Tour 2004-05 was his closest rival, the Indian Tiger Woods Ashok Kumar, who is also placed second in the Amby Valley PGAI Order of Merit this year. Tied with Ashok on the second spot was overnight leader and defending champion Harinder Gupta who had a bad round today in spite of the weather being very helpful today with no winds blowing. Ashok submitted a card of two under 70 to tally six under 210 after 54 holes, while local champ Harinder played bad today as he submitted a card of two over 74 to tally six under 210 after 54 holes. The weather here was very good with less heat and no winds as most of the golfers registered under par scores. Local lad Ranjit Singh, who is currently placed sixth on the money list of the Amby Valley PGAI Tour, recorded the best round of the day along with the Chennai-based pro Sandeep Syal and Mukesh Kumar as they all submitted a card of five under 67. 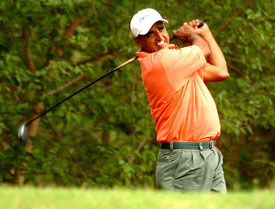 This score of five under 67 in the penultimate round of the Hero Golf Open 2005 helped Ranjit to move on to the second leader group for the last round of the tournament as he was placed in the fourth spot tied along with Digvijay Singh, Pappan, and Rafick Ali Mollah. “My game was normal today. My driving was very well today but my putting needs to improve. I am not getting confidence while putting as I missed a few birdie putts today,” said Ranjit Singh. Chennai-based pro Sandeep Syal also had a very good round as he fired seven birdies along with two bogies on the 10th and 17th holes to finish at the eighth spot as he totalled two under 214 at the end of 54 holes today. Meanwhile, leading amateur Gaganjeet Bhullar fought back to regain the top spot amongst amateurs as he submitted a card of level par 72 to total six over 222 at the end of 54 holes today. Pros (after 54 holes): 209 — Mukesh Kumar (70,72,67); 210 — Ashok Kumar (69,71,70), Harinder Gupta (66,70,74); 213 — Ranjit Singh (74,72,67), Digvijay Singh (68,76,69), Pappan (70,71,72), Rafick Ali (65,74,74). Amateurs: 222 — Gaganjeet Bhullar (73,77,72); 223 — Raghav Wahi (73,77,73). The Kurukshetra team, comprising some talented boys who took part in the All-India Inter-University Championships, proved to be far superior to their rivals as they notched up a comprehensive 25-15, 25-20 victory. The other teams to make the last four grade were Dogra Regiment who downed Amargarh Volleyball Club 25-19, 25-19, Babarpur Volleyball Club who beat Alam Club in a thrilling three setter 25-20, 18-25, 15-13 and 18 Guard who too needed three sets to get the better of 3 Dogra 25-21, 17-25, 15-13. Earlier, the tournament was inaugurated by Samana MLA, Mr Surjit Singh Rakhra in the presence of PSEB, Deputy Director (Sports), Mr Bir Devinder Singh, Arjuna Awardee boxer, Mr Jaipal Singh, officiating District Sports Officer, Mr S.S. Gill and a host of other prominent players and officials.